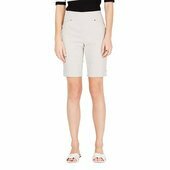 The essential style for summer: these effortless pull-on Bermuda shorts from I.N.C. International Concepts. Mid rise; front: approx. 11"